Robbie Taylor Hunt meets with writer and director, Patrick McCarthy, to discuss his ‘hyperrealist’ play, The Sky is Well Designed, and the purpose of environmental theatre. At the Melbourne Fringe Festival, there was a noticeably large amount of plays that centred on an apocalyptic world – unsurprising considering the current state of international politics. Being a fan of dystopic stories, I booked my tickets to a range of these imaginative, prophetic, cautionary pieces. One play, The Sky is Well Designed, was a brand-new sound-theatre immersive performance by contemporary theatre company Fabricated Rooms. The word ‘unique’ gets thrown around a lot in show descriptions during any Fringe, but The Sky is Well Designed deserves the label. Set in the near future, it centres around two scientists – Thomas and Bear – in an unidentified barren part of the Australian landscape as they undertake a study examining the musical qualities of electromagnetic energy. As if the plot isn’t peculiar enough, the piece’s style is unlike anything I have experienced before, utilising music composition (the Robert Jordan-composed soundscapes are created live by the actors with looping machines), fragmented dialogue with a languid rhythm, and a sense of being kept in the dark. The Sky Is Well Designed professes to ‘transport audiences to a fleeting moment where humans attempt to speak with the natural environment as it decays around them’. I meet the Writer and Director, Patrick McCarthy, in a café in Northcote. We order lemonade (for him) and an orange juice (for me), and settle into a comfy booth. His kind, unpretentious demeanour makes it easy to start chatting about the show. The Sky is Well Designed claims it ‘explores our relationship to transience and the natural environment’. I’m interested in the relevance of transience to nature, as I would think of nature as a constant, rather than something fleeting. “The characters have a weird experience with the natural environment, by mediated means rather than naturally,” Patrick says, referring to how Thomas and Bear attempt to communicate with the sky through various technological and musical means. We go on to discuss how modern engagement with nature is often detached and brief, with Patrick giving the example of experiencing the Sahara through David Attenborough rather than travelling to it and experiencing it first-hand. “Or someone taking a picture of a bird and putting it on Facebook, while there’s a bird outside my living room that I could go and look at. We have an increasingly mediated relationship with nature.” Indeed, programmes such as David Attenborough’s recent Planet Earth 2 and Blue Planet 2 enjoyed great acclaim and popularity, but it didn’t necessarily inspire everyone to visit the world’s jungles for themselves. 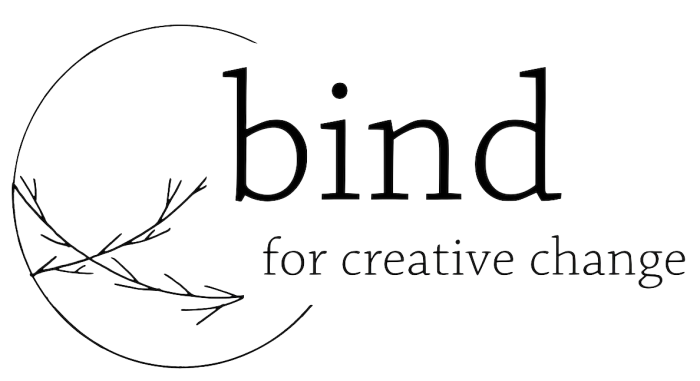 We continue discussing bind and how it allows artists to share personal and creative responses to various issues surrounding our environment. “We need to try to think: what’s our emotional, lived experience of climate change? There’s loads of art at the moment of the world we might be heading towards. Art is good for exploring what it feels like during the day to day. It’ll probably still feel scary and intense, but it’s still nice to talk to someone else.” I agree with him, acknowledging the connections and togetherness that can come from experiencing art with others, either in reality or in an online space. As I work in theatre myself, I’m keen to know what specific role theatre can have concerning climate change. “For me, it’s about re-introducing the human and emotional element into it, because it’s so easy for conversation to be hijacked by politics, and that clearly isn’t getting us anywhere. We were arguing the facts, and we all thought that would be sufficient but it’s not.” This seems particularly appropriate regarding how falsehoods were embraced during the campaigns for Brexit and Trump’s election (then his entire presidency), resulting in ‘post-truth’ being the Oxford Dictionaries’ Word of the Year in 2016. “There’s too many vested interests, and too much money in convincing people it’s not real, it’s not happening, and that the solutions aren’t real. Artists’ contribution is to re-humanize. What are the emotional qualities? So we should place the story [of climate change] with characters and in aesthetics that resonate with it. “I have no illusions about change. People seeing a play about the environment are already on board, it’s not made for people who don’t agree, it’s a space to think and feel about these things.” Theatre is certainly the perfect space for communally tackling problems in emotive ways. So, who has the right to tell stories about climate change? The Sky is Well Designed was presented by Darebin Arts Speakeasy and Fabricated Rooms.